The legendary bestselling author and renowned psychiatrist M. Scott Peck, whose books have sold over 14 million copies, reveals the amazing true story of his work as an exorcist — kept secret for more than twenty-five years — in two profoundly human stories of satanic possession. 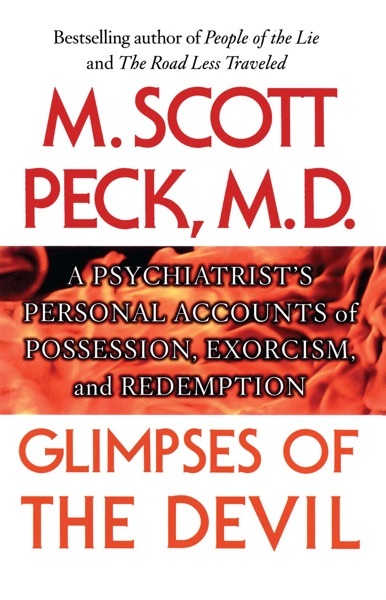 In the tradition of his million-copy bestseller People of the Lie: The Hope for Healing Human Evil, Scott Peck’s new book offers the first complete account of exorcism and possession by a modern psychiatrist in this extraordinary personal narrative of his efforts to heal patients suffering from demonic and satanic possession. For the first time, Dr. Peck discusses his experience in conducting exorcisms, sharing the spellbinding details of his two major cases: one a moving testament to his healing abilities, and the other a perilous and ultimately unsuccessful struggle against darkness and evil. Twenty-seven-year-old Jersey was of average intelligence; a caring and devoted wife and mother to her husband and two young daughters, she had no history of mental illness. Beccah, in her mid-forties and with a superior intellect, had suffered from profound depression throughout her life, choosing to remain in an abusive relationship with her husband, one dominated by distrust and greed. Until the day Dr. Peck first met the young woman called Jersey, he did not believe in the devil. In fact, as a mature, highly experienced psychiatrist, he expected that this case would resolve his ongoing effort to prove to himself, as scientifically as possible, that there were absolutely no grounds for such beliefs. Yet what he discovered could not be explained away simply as madness or by any standard clinical diagnosis. Through a series of unanticipated events, Dr. Peck found himself thrust into the role of exorcist, and his desire to treat and help Jersey led him down a path of blurred boundaries between science and religion. Once there, he came face-to-face with deeply entrenched evil and ultimately witnessed the overwhelming healing power of love. In Glimpses of the Devil, Dr. Peck’s celebrated gift for integrating psychiatry and religion is demonstrated yet again as he recounts his journey from skepticism to eventual acknowledgment of the reality of an evil spirit, even at the risk of being shunned by the medical establishment. In the process, he also finds himself compelled to confront the larger paradox of free will, of a commitment to goodness versus enslavement to the forms of evil, and the monumental clash of forces that endangers both sanity and the soul. Glimpses of the Devil is unquestionably among Scott Peck’s most powerful, scrupulously written, and important books in many years. At once deeply sensitive and intensely chilling, it takes a clear-eyed look at one of the most mysterious and misunderstood areas of human experience.